Learn harp in the comfort of your own home, whatever time of the day or night suits you, without the isolation and frustration of self-study. being able to access tutoring at any time of the day or night to suit you. being supported by an online community of like-minded course mates. being able to repeat lesson as many times as you need at your own pace. being able to learn the harp in the comfort of your own home. sitting down at your harp, playing your favourite tune and someone telling you it is beautiful. joining a course where you can sound wonderful from day one! 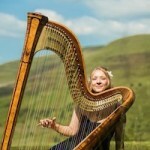 START HARP is an online harp course for beginner harpists, created by passionate and dedicated harpist Shelley Fairplay. It consists of three separate levels (1, 2 and 3), each delivered over a 12 week period. START HARP is offered in three levels. Level 1 is designed for complete beginners, level 2 for those with some basic technique and skills and level 3 for beginners who have really taken to the instrument, learnt the foundations and flow and want to push themselves further! Each level costs £295, however there is an early bird price of £245 at the start of registration for each course! Each level will be delivered over 12 weeks, with ten lesson weeks, one “catch up” week mid term and a review week at the end. The course materials can be accessed online at whatever time of the day suits the students’ lifestyle. The content is delivered in the form of video tutorials, reading materials and play along practice tracks. It is also optional for students to submit 6 pieces of homework and receive feedback from Shelley alongside attending 6 live Q & A webinars, where questions can be asked and answered live during the session. The live sessions are recorded so if students are unable to attend they can be replayed at a students’ leisure. All students will be given access to a closed Facebook group where alongside Shelley all START HARP students can interact to share ideas, support each other through challenges and celebrate successes. 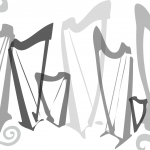 The START HARP BEGINS – LEVEL 1 course works on the foundations and building blocks required to help you take the first steps towards becoming a proficient harpist. We will work on the foundations of harp playing to enable you to move forwards and enjoy playing this incredible instrument. You will very quickly find you have a basic working knowledge of how to play by ear and from written music, and how to improvise! The course presumes no prior knowledge of the harp or music and is based in C major. During the 12 weeks of the ‘live’ course (10 tuition weeks, a catch up week and a review week) you will study from the very beginning basics in harp technique, music theory and musicianship from the comfort of your own home, on a lever, lap or pedal harp. These classes will enable you to access beginner level harp tuition at a time and pace to suite you, as once the ‘live’ course has finished you will have a further 12 months to access all the materials. START HARP LEVEL 1 materials are all based in C major and can be accessed on any harp with a two octave note range (C to C to C) or more. If you need any help choosing your harp take a look at the useful links page or email Shelley via the contact page. Ready to sign up for next term? To hear START HARP news sign up to Shelley’s Mailing list. We use all your foundation harpist skills to build on and work on fluidity when playing, confidence and really ‘owning’ your abilities. Each week you will be introduced to a new repertoire piece and given activities including warm up ideas relating to the piece, exercises to help you master tricky sections and ways to extend and add to the piece to ‘make it your own’. The course is based solely in C major. The elements focused on in LEVEL 1 such as technique, learning by ear, improvisation and reading from the music will all be developed further in this course. We also cover the ‘modes’ to expand our harmonic horizons and the theory of basic chords and inversions. During the 12 weeks of the ‘live’ course (10 tuition weeks, a catch up week and a review week) you will study from the very beginning basics in harp technique, music theory and musicianship from the comfort of your own home, on a lever, lap or pedal harp. These classes will enable you to access harp tuition at a time and pace to suite you, as once the ‘live’ course has finished you will have a further 12 months to access all the materials. START HARP LEVEL 2 materials are all based in C major and can be accessed on any harp with a two octave note range (C to C to C) or more. If you have any questions please email Shelley via the contact page. As in all the courses, LEVEL 3 consists of videos and written materials designed to help you work on theory, technique, new repertoire, improvisation and playing by ear. This course has a focus on learning to play in different keys, the major, natural minor, harmonic minor, melodic minor and pentatonic scales (up to 3b’s and 3#’s). Techniques for “Moving on” Including looking at harmonics, different ways of damping, 4th finger slides, thumb slides, mid piece lever/pedal changes and trills. “Think Theory” lessons: Including reading and writing pedal charts, modulating to join pieces together, learning new key signatures, learning about relative major/minors. ‘A Spotlight On’ lessons: Including; practice techniques, avoiding aches and pains, extending repertoire quickly, preparing to perform and learning to teach yourself. START HARP LEVEL 3 materials are all based in C major and can be accessed on any harp with a three octave note range (C to C to C to C) or more. If you have any questions please email Shelley via the contact page. Dreams to Reality – START HARP! Are you looking to learn the harp?! START HARP Questions Answered on FACEBOOK LIVE! 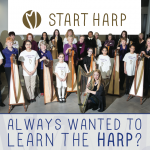 Take the START HARP quiz! Why choose to study online with START HARP? Have you brought a harp and not been able to find a local teacher? 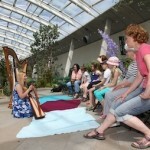 Did you dream of learning harp as a child but never have the opportunity? Have you been given a lap harp but found all the tutor books are aimed at pedal harps and lever harps? Are all the harp teachers in your area full with long waiting lists?Would you prefer not to learn from scratch with one-to-one lessons and learn the foundations before attending face-to-face sessions? Are classes in your area all aimed at a particular age group? Have you been told your harp is not the correct or proper instrument to learn on? Have you begun teaching yourself the harp and been frustrated by not moving forwards fast enough? Have you never learnt and instrument before and feel you cannot begin from scratch on the harp? Q: What level should I choose? A: You will need to have access to a harp (any shape or size – see info above), a computer with internet access and for homework submission a way of making videos (e.g. by using your phone, internal computer camera, other filming devices). Who is Harpist Shelley Fairplay? Shelley Fairplay is a performer and teacher with over 15 years experience teaching harp, harp ensembles and workshops for all ages. She’s also the founder of ‘Harpist for a Day’, a program that gives non-harpists the opportunity to go from first note to concert performer in a single day. Her successful concert series ‘The Three Strands: Passion, Sorrow and Joy’ was premiered in the UK in 2014, and her CD of the same name was released in 2015. Her 2016 concert series ‘HarpOSphere,’ like all her concerts, featured her own original works along with her arrangements of popular, classic and traditional tunes. She has performed throughout the UK, and appeared in Europe and the U.S. as a soloist and alongside internationally renowned harpists including electric jazz harpist Deborah Henson-Conant. Her Dynamic Harps Ensemble, features both an adult and children’s group, filled with harpists who enjoy learning and performing music from films, pop, shows, classical, Jazz and celtic genres. 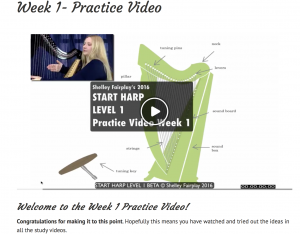 2016 saw the launch of her brand new online harp course for beginner harpists, START HARP. Shelley Fairplay has University and music college qualifications (Degree and Masters in music), teaching diploma from ABRSM and she is a fully qualified school classroom teacher with over 5 years of class and workshop teaching experience. Shelley says: ‘I have a great passion and enthusiasm for all aspects relating to the harp and I want to share it with you! I look forward to welcoming you to the classes! If you do not quite feel ready to take the course this term then sign up for Shelley’s mailing list and she will let you know when the next classes start. Yes please! Sign me up for the START HARP mailing list!